Is Maria das Neves already in Heaven? Yes, she is. It seems to me that she was about sixteen years old. And Amelia? She will be in Purgatory until the end of the world. It seems to me that she must have been between eighteen and twenty years old. So, if a girl of 18 years of age, from a remote village at the turn of the 20th century, is sent to Purgatory until the end of the world, where do I stand before God when my turn comes to account for this life that I have lived surrounded by all of the world’s modern temptations and sins. What can I do for Amelia and others like her in Purgatory rendering an account for each and every idle word until the last farthing is paid. Can I also reduce, if not eliminate my own sentence if I am fortunate enough to escape the fire of hell? 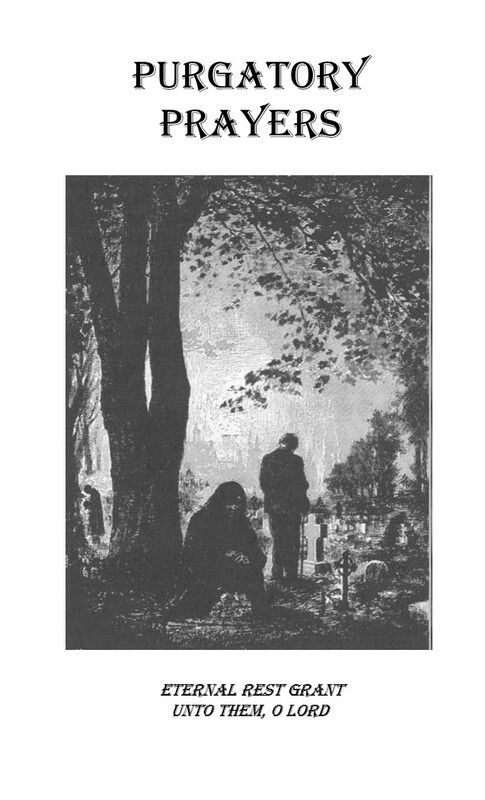 The answer is yes, by using the prayers in this booklet and making sacrifices for the Holy Souls in Purgatory. Blessed are the merciful, for they shall obtain mercy. (Matt. 5:7). 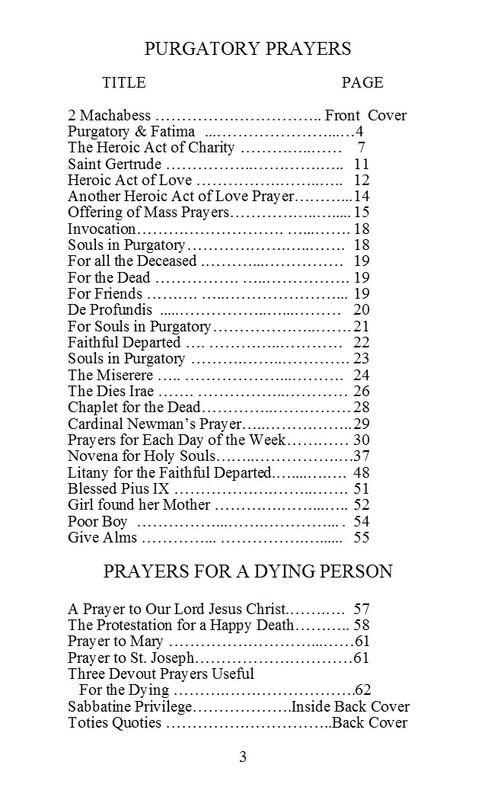 This 64 page manual has 24 prayers for the Holy Souls, 5 prayers for the dying and 20 illustrations. The booklet on purgatory prayers is a beautiful meditative prayer book that clearly benefits the souls of the departed but also brings spiritual richness to the prayer life of the Catholic. 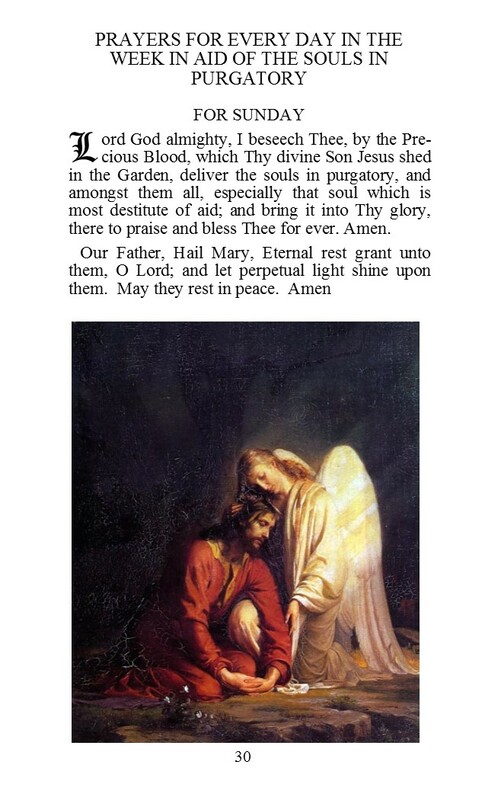 The booklet begins with the blessed Virgin Mary’s confirmation of the existence of purgatory at Fatima, and then moves on to the description of the purgatory prayers as an heroic act of charity. 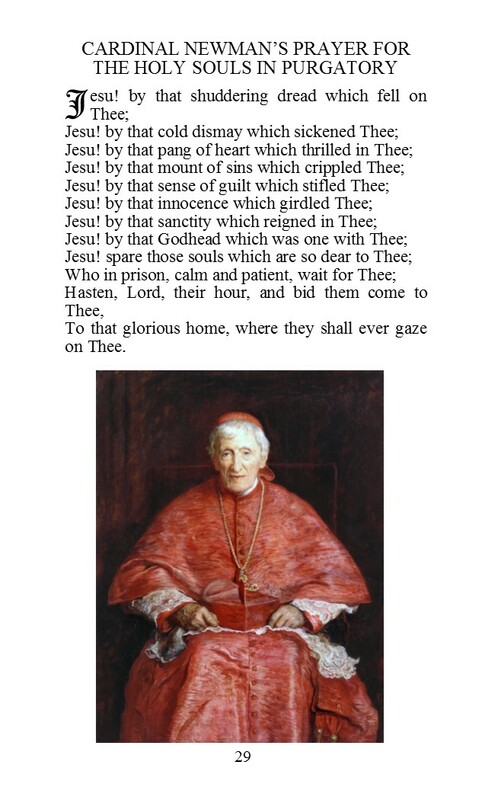 This 63 page prayer booklet is complete with variety of prayers for the holy souls including Cardinal Newman’s prayer for the Holy souls in purgatory, the rosary for the dead and many others. This booklets truly exhibits the richness of the deposit of Catholic faith. Originally published in 1904, the booklet “Purgatory Prayers,” offers a lovely collection of classic prayers, a novena, and many pious anecdotes. Together, they will serve to strengthen a Catholic’s resolve to pray and sacrifice on behalf of the suffering souls in Purgatory with renewed fervor. The booklet’s beautiful graphics, modern, easy-to-read typeface, and its convenient size make it a perfect companion for the month of November, dedicated to the Holy Souls in Purgatory. Undoubtedly though, it will also encourage the Catholic to develop the habit of incorporating these devotions into his prayer life throughout the entire liturgical year, not only for the relief of the suffering souls, but for his own spiritual benefit as well. How can i order prayer booklet? If you are using a regular computer, please select the Yellow button labeled “Add to Cart” underneath the title of the book that you wish to purchase. And from there you can pay with either a Paypal account or your own credit card, you have the option to chose. If you would like to pay with a check or money order, please select the word “here” under the title Printable Order Form on the column on the right hand of the screen above the Shopping Chart column, and then when the PDF screen of the order form appears, then you can print the form.